It was more whimsical than craving-driven. I just want to make Thai tea crème brûlée period. But I didn't realize that finding Thai tea as in boxed tea labeled "Thai tea" will be so difficult. In fact I didn't find any. So I ended up using orange pekoe black tea. That would work, I thought. But I know I won't be able to achieve that amber colored crème brûlée. I guess that will be another crème brûlée escapade. 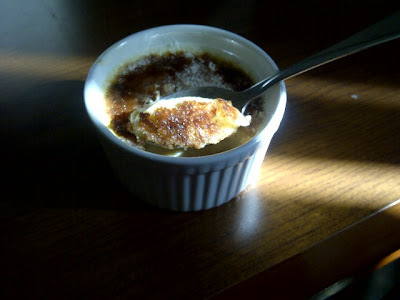 I used my Torchless Crème Brûlée recipe and just substituted some of the ingredients. Place the half and half into a medium saucepan set over medium-high heat and bring to a boil. Transfer half of it to a bowl and place six tea bags and allow to steep for about 3 minutes. Meanwhile, add the heavy cream to the sauce pan and bring to a boil, stirring constantly to avoid burning or overflowing. Remove the tea bags and pour the milk tea to the rest of the cream (half and half and heavy cream) in the sauce pan. Remove from heat and set aside. In a medium bowl, whisk together sugar and the egg yolks until well blended and starts to lighten in color. Add the cream a little at a time, stirring continuously. Pour the liquid into 6 (7 to 8-ounce) ramekins. Place the ramekins into a large cake pan or roasting pan. Pour enough hot water into the pan to come halfway up the sides of the ramekins. Bake just until the creme brulee is set. I normally remove the ramekins from the roasting pan while the custard centers are still jiggling but in this case, just turn off the oven but let the roasting pan with the ramekins inside the oven for about 12 minutes before taking out to cool. 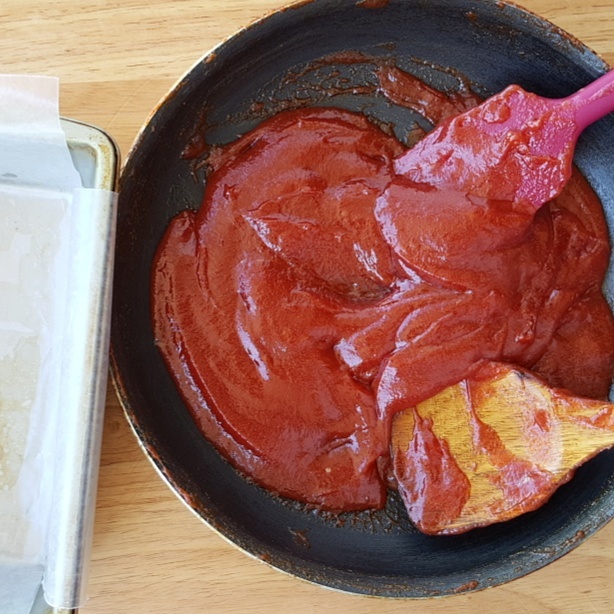 Remove the ramekins from the roasting pan and refrigerate for at least 2 hours and up to 3 days. 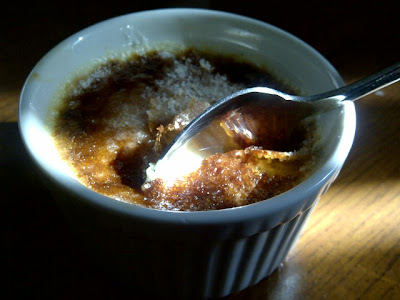 Remove the crème brûlée from the refrigerator for at least 30 minutes prior to browning the sugar on top. Sprinkle 1-2 teaspoon sugar evenly on top of each custard. Preheat broiler and place custards on baking sheet. Broil until sugar melts and caramelizes, moving the baking sheet around for even browning. Serve immediately, or refrigerate custards until topping is cold and brittle, about 1 hour and up to 2 hours. It's pretty easy to make once you get the hang of it and it's just so exciting and a lot of fun playing with different flavors. Hi again Faye...That creme brulee looks so yummy. I need to learn on how to caramelized those sugar on top. Look, my babies are home!